Rega Elex-R review | What Hi-Fi? Michael Phelps wouldn’t be considered the greatest Olympian of all time had he settled for his gold rush in 2004 and not persevered by coming back every four years to win some more. Likewise, the Rega Elex-R has been nothing if not persistent since its arrival, and was rewarded with a first Award in 2014. The Rega has since beaten the likes of Arcam's A29 and Audiolab's 8300A, and now must bat away yet another wave of competition to earn a fifth consecutive What Hi-Fi? Award. But with that competition including new (and more affordable) entries from Cyrus and Audiolab, the Rega has certainly got its work cut out this time. Think of this integrated amp as a more muscular Brio-R (£480) and you’ll be pretty close to the mark. The build quality is as solid as we expect from Rega, and while the casework is functional rather than luxurious, it’s finished neatly and everything feels like it will last for years. In fact, our sample has been a staple in our hi-fi test room for almost three years without any problems. We’re a little disappointed with the remote, though, which works well enough but lacks the solidity of rival handsets. By using the much admired Brio-R as a base, and adding circuit elements from the unquestionably talented Elicit-R (£1600) into the mix, Rega has created one of the most talented sub-£1000 amplifiers we’ve heard. Anyone familiar with Rega’s current amplifier range will find the Elex-R’s sonic character familiar. It delivers a fast, agile sound that’s as rhythmically surefooted as we’ve heard at this level – and that can’t be stressed enough. With Macklemore and Lewis’ Thrift Shop, it’s head, maybe even shoulders, above the Cyrus One, Audiolab M-ONE and Heed Elixir when it comes to rendering rhythms. A combination of impressive timing, space and dynamics means that beat can be true allies of the backing vocals and a shaker, with nothing sounding remotely random or like the Rega is freewheeling. There’s an addictive sense of liveliness and energy, something most rivals tend to tone down in the search for greater refinement, and it demonstrates authority and scale better than anything we've heard at this price too. It’s equally at home with a classical or vocal-led piece like Nina Simone’s I Put A Spell On You. There’s a newfound sense of rawness and realism in her deep, guttural delivery, and the Rega conveys nuances better than any of its peers. Tonally, the Elex-R edges towards leanness, though if partnered with care – avoiding sources and speakers that err too far towards brightness or harshness – then all will be fine. We use a range of speakers from Dali’s lively Zensor 3s and Dynaudio’s Emit M20s right the way to the ATC SCM11s and PMC Twenty 26s and at no point does the Rega fail to shine. Of course a power output of 72W per channel into 8ohms isn’t enough to make the floor shake in really large rooms, but we think this amplifier is capable of decent levels in most set-ups. It's as happy picking out finer threads of detail in the convoluted sections of Hans Zimmer's Mountains from the Interstellar soundtrack – often the first to be overlooked by less scrupulous amps – as it is unveiling variation in hammering electrics in Band of Horses' NW Apt. We are pleased with the resolution on offer, and at no time is there a sense the Elex-R is overlooking subtleties for the benefit of the bigger picture. We notice, again, that this amplifier is terrific at communicating the drama of the music. It has us hooked from the first note, right to the end of the piece. 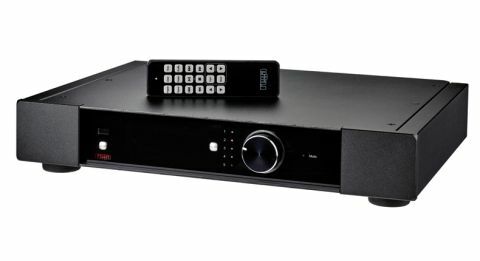 If all you want is a traditional stereo amplifier, the Rega remains on sure ground. There are no digital inputs, instead you get a good quality MM phono stage, one that’s talented enough to make the most of £1000 turntable packages, such as Rega’s own RP6. It’s a relatively quiet circuit, one that keeps all the good sonic points we noted in the line stages. There are four line-level inputs, one tape out and a single preamp output, should you need to add a bit more muscle. That’s probably enough for most purist stereo set-ups, although the absence of a built-in headphone output is a slight snag, considering its inclusion in so many rival amps. The Elex-R is a mighty fine achievement; the kind of product that gets straight to the heart of the music and conveys all the emotion in the recording with ease. Five years have passed since it first scooped an Award, and despite the increasing number of very good amps around the £1000 mark, the Rega has more than enough talent across the board to continue to shine above its peers.